The most effective bed bug treatments aren’t found in a single product. There is no spray or machine that can kill them all and keep them from coming back. To fight bed bugs, you need a holistic solution involving a combination of products. Combine mattress covers with traps, vacuums with steamers, and sprays with powder. Choosing the right bed bug powder used to be easy, because there used to only be one on the market: diatomaceous earth. Now that’s changed, with CimeXa rapidly growing in popularity. CimeXa is a uniquely engineered silica dust that’s similar to diatomaceous earth, but with a few twists and upgrades that make it worth consideration. Like diatomaceous earth, CimeXa is a residual powder that clings to bed bugs that come in contact with it, and absorbs the waxy cuticle on their shells, causing dehydration and death. What sets CimeXa apart is how quickly it works. In testing, CimeXa has been shown to kill bed bugs over three times faster, which helps ensure that bed bugs won’t have a chance to feed and repopulate. CimeXa can be applied as a dust, like diatomaceous earth, or can be mixed with water and applied through a hand-pumped sprayer. 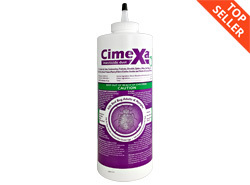 Once applied, CimeXa can remain effective for up to 10 years as long as it’s left undisturbed. There’s no odor or staining, and it won’t absorb water vapor except in very high humidity conditions. For use against bed bugs, we recommend applying CimeXa with a professional powder applicator, which will allow you to reach into deep cracks and crevices throughout your room. Apply CimeXa into the joints and cracks of your bed frame, behind your headboard, around and behind picture frames or other wall hangings, along moldings and baseboards, and into wall voids and other cracks and crevices. You can also unscrew the baseplates of light switches and electrical outlets to puff powder into the wall. In addition to puffing with a powder applicator, you could also mix CimeXa with water in a pump sprayer. CimeXa will suspend in the water without absorbing it, and will stay where it’s applied after the water evaporates. You can spray CimeXa into empty drawers, inside cupboards, and in the interior framework of your box spring. When using CimeXa, be sure to avoid letting the powder touch your eyes or clothing. Clean up any powder that puffs outside of the applied cracks and crevices, and wash your hands after the treatment. Don’t apply any type of insecticide powder, including CimeXa, into open areas. Remember to always follow the product label and MSDS for safe and effective usage. CimeXa has really impressed us. Its claims are bold, yet its lab (and real-world) results back it up. Use it in a puffer and in a sprayer, after you’ve applied your contact and residual sprays, and you have a winning residual solution. CimeXa is available online now in two different sizes. Homeowners looking to treat just a couple of rooms will do fine with the 4-ounce bottles, but professionals can save some money per ounce by opting for the 5-pound pails. CimeXa’s engineered silica composition achieves rapid control while remaining viable for up to ten years (when undisturbed). With its broad label usage, CimeXa Insecticide Dust is a comprehensive asset for pest elimination to service professionals, and is now available to residential users as well.